This is a series written for those who are struggling mightily with their finances and tough decision are being made about who will and will not be paid. It is my hope that this series will provide practical steps that can be taken to walk out of this situation and into financial freedom. It’s extremely important to understand why you are stuck. Now that you have identified the reasons you are stuck, it is time to prepare a written spending plan. That’s right, a budget. Here is something I have learned – planned money accomplishes far more than unplanned money. There is so much power in a written spending plan! I never realized where all of my money was going until the day I began planning my spending. A spending plan will ensure you know the actual situation instead of the imagined situation. I know what you have is limited, and in some cases, very limited. It is imperative, however, that you plan what you do have. There are free tools available on the I Was Broke. Now I’m Not. website (just click on TOOLS). Monthly Budget Form (Excel) If you are paid once per month, this is the budget tool for you. Weekly Budget Form (Excel) If you are paid multiple times per month (twice/month, bi-weekly, bi-monthly, weekly, etc), this is the budget tool for you. 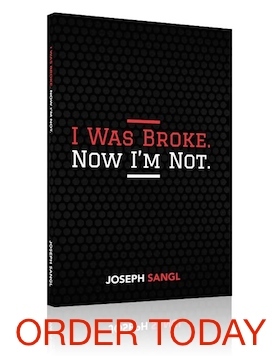 My newly revised book, I Was Broke. Now I’m Not., has four chapters devoted specifically to teaching you how to use a budget to thrive financially. Posted in Finance, I'm Stuck! Help! If I was in your shoes, I would tithes first. As a Christ follower, I believe that when we honor God first he will take care of the rest. This is not an easy decision. It really is a faith test. If we can help you in anyway, please let us know!